One of the founders of Die Brücke, (the Bridge) in 1905 along with Erich Heckel, Ernst Ludwig Kirschner, and Karl Schmidt-Rottluff, Nolde was intensely interested in printmaking. 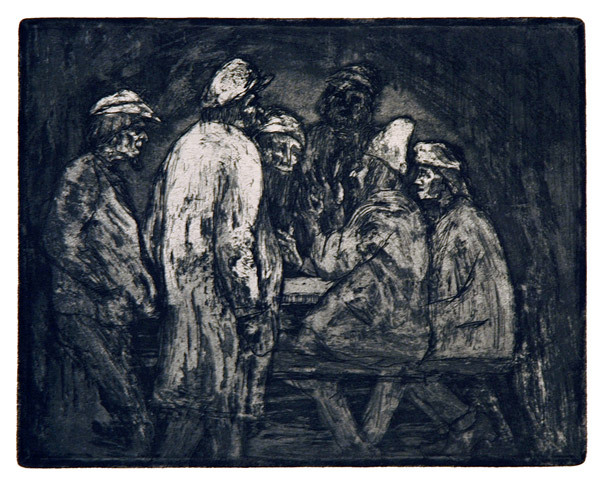 The artists of the group frequently circulated exhibitions of prints in woodcut, etching, and lithograph; their hope was to strike a prophetic chord and awaken their compatriots to a new, free, passionate age. Nolde, however, was too inclined to go his own way (and too much inclined to be suspicious of everyone) to stay with any group for long. Instead, he withdrew to work by himself on the moors and at the seashore of Northern Germany. His work, all of which was condemned by the Nazis as "Degenerate," is deeply spiritual and extremely intense, particularly his earlier work. The Prophet, pictured below, is his most famous print and the work that, for many, best defines German Expressionism. 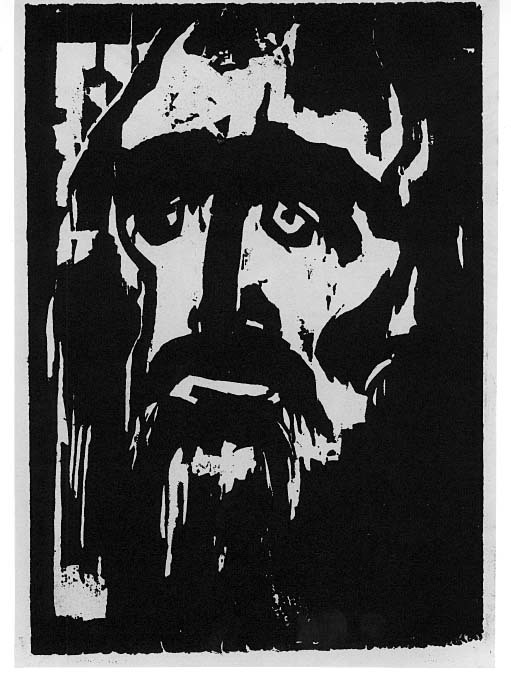 Nolde wanted his woodcuts to "embody an inner spiritual resonance," and he wrote, "I want so much for my work to grow forth out of the material, just as in nature the plants grow forth out of the earth, which corresponds to their character" (1906; quoted in German Expressionist Prints and Drawings: The Robert Gore Rifkind Center for German Expressionist Studies, Vol. 1 [Los Angeles: The Los ANgeles County Museum of Art, 1989], p. 50). In an essay for the volume, "The Revival of Printmaking in Germany," Ida Catherine Rigby obsrves, "In his protoypical Expressionist woodcut, the 1912 Prophet, he combined monumental planar effects with the dramatic use of light. In it, the brooding power of prophecy, the mysterious combination of vision out of darkness, and the melancholy of the prophet, who is too often unheeded in his own time seem to well forth from the inner recesses of the block, demonstrating the unity of form and content that characterizes Expressionism" (p. 52). Selected Bibliography: Boston, MA: Museum of Fine Arts, Nolde: The Painter's Prints (Boston: 1995); Rudy Chiappini ( Milan, Electa, 1994); M. Gosebruch, Nolde Watercolors and Drawings (British Library Cancel, 1972); Werner Haftmann, Emil Nolde: The Library of Great Painters. (NY: Harry N. Abrams, 1959); Werner Haftmann, Emil Nolde, Unpainted Pictures (NY: Frederick Praeger, 1965); Rudolf Hoffmann, ed., Radierungen von Emil Nolde (Bremen: Michael Hertz, 1948); M. Moeller and M. Reuther, Emil Nolde: der Druckgraphiker. 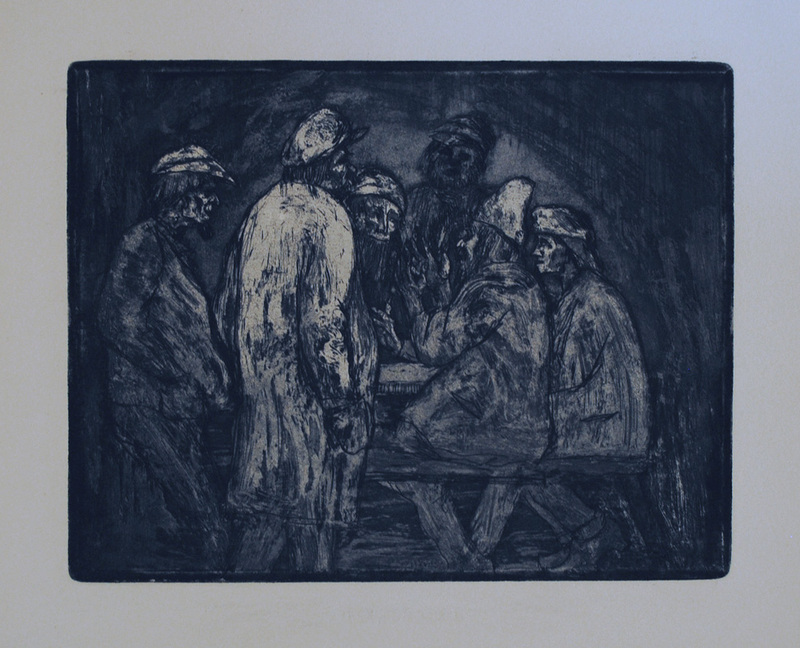 Druckgraphik aus der Sammlung der Nolde-Stiftung Seebull (Munich: Hirmer Verlag, 1999); Peter Selz, Emil Nolde (NY: Museum of Modern Art, 1963); Max Sauerlandt, Emil Nolde (Kurt Wolff verlag, 1921); .M. Urban, Emil Nolde: Werkverzeichnis der Gemälde 1895-1951. 2 vols. (München. 1987. Tischgesellschaft / Dinner party (Schieffler and Mosell 38 iv, Davis-Riffkind 2113). Original etching on wove paper, 1906. A beautiful impression of this dark and mysterious work from the beginning of Nolde's career as an expressionist. Schieffler and Mosell call for an edition of 20 with 12 trial proofs without the printed text before it was published in the 1907 issue of Zeitschrift fur bildende Kunst n.s. 19, n. 2 wth the printed text TISCHGESELLCHAFT below the etching. Ours is a brilliant impression without the text, but with a faint suggestion of abrasion below the image where the title would have been printed if it were from the 1907 publication. In short it is either a proof before the 1907 printing, an impression from the 1907 printing with the text removed, or it is a trial proof from the 1906 very small printing. We have priced it as if it were from the 1907 publication in Zeitschrift fur bildende Kunst n.s. 19, n. 2. Image size: 151x190mm. Price: $6500. Tischgesellschaft / Dinner party (Schieffler and Mosell 38 iv, Davis-Riffkind 2113). Original etching on wove paper, 1906. A beautiful impression of this dark and mysterious work from the beginning of Nolde's career as an expressionist. Published in the 1907 issue of Zeitschrift fur bildende Kunst n.s. 19, n. 2. With the printed text TISCHGESELLCHAFT below the etching. Image size: 151x190mm. Price: SOLD. Madonna (Schieffler 142, Davis-Riffkind 2129). Original woodcut on wove paper, 1917. A beautiful impression of this powerful yet tender image, done in a year when other mothers' children all over Europe were dying in huge numbers in the war. Image size: 214x153mm. Price: SOLD. The Prophet. 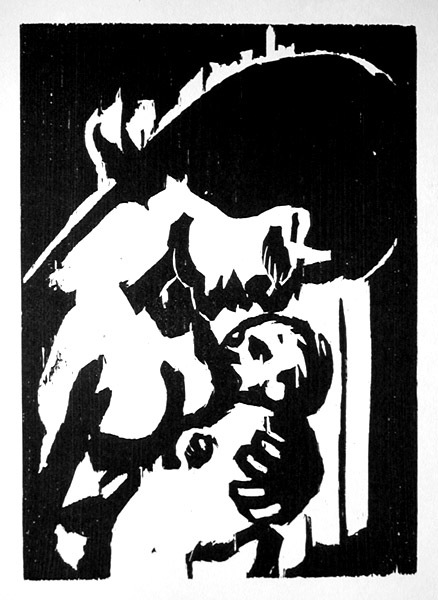 Original woodcut, 1916. Original edition size unknoiwn. Our impression comes from an edition published in the deluxe German art review, Genius (1919) on paper without margins. Image size: 221x146mm. Price: SOLD.